Leia a versão em Português desta postagem clicando aqui. Brazil has more freshwater than any country in the world – 12 percent of the entire planet’s total volume. So how is São Paulo—the richest, largest city in South America—running out of water? Three maps help tell the complicated story. 1) It’s a Distribution and Management Problem. Brazil’s water resources and population are very unevenly distributed. The Amazon River basin contains roughly 50 percent of the country’s water, but only 4 percent of its population. About 80 percent of Brazilians are concentrated in megacities along the east coast, like São Paulo and Rio de Janeiro, which rely on their own local river basins. Many of these cities are water stressed, due to their rapid growth and development. 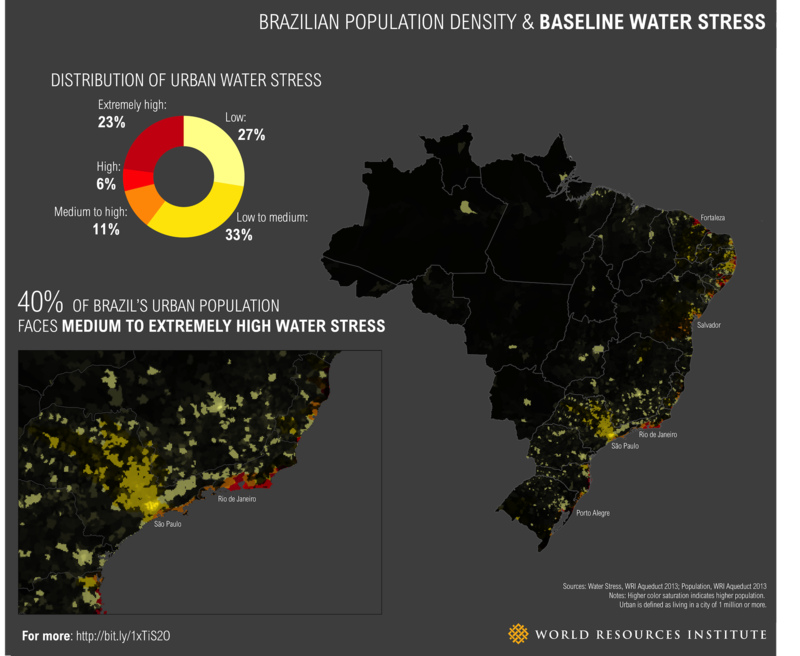 WRI’s Aqueduct project recently analyzed water stress in Brazilian cities with more than 1 million people. About 40 percent of the population in these largest cities faces medium to extremely high water stress. This means that, depending on the particular location, as much as 80 percent of the water naturally available to agricultural, domestic, and industrial users is withdrawn annually, leaving businesses, farms, and communities vulnerable to scarcity. Based on this relationship of demand and supply in a typical year, São Paulo, in fact, faces low to medium water stress. But this is far from a typical year. On top of São Paulo’s epic drought right now, a series of interconnected water management failures across the metropolitan area have hindered its ability to adapt to those conditions, according to Brazilian researchers. São Paulo demonstrates how destabilizing a drought can be—even in less-stressed areas—without adequate management. Other more-stressed cities in the region could therefore be at even higher risk. 2) It’s a Variability Problem. Water supplies can vary significantly from season to season and from year to year in Brazil. Most of Brazil experiences pronounced wet and dry seasons, otherwise known as high seasonal variability. 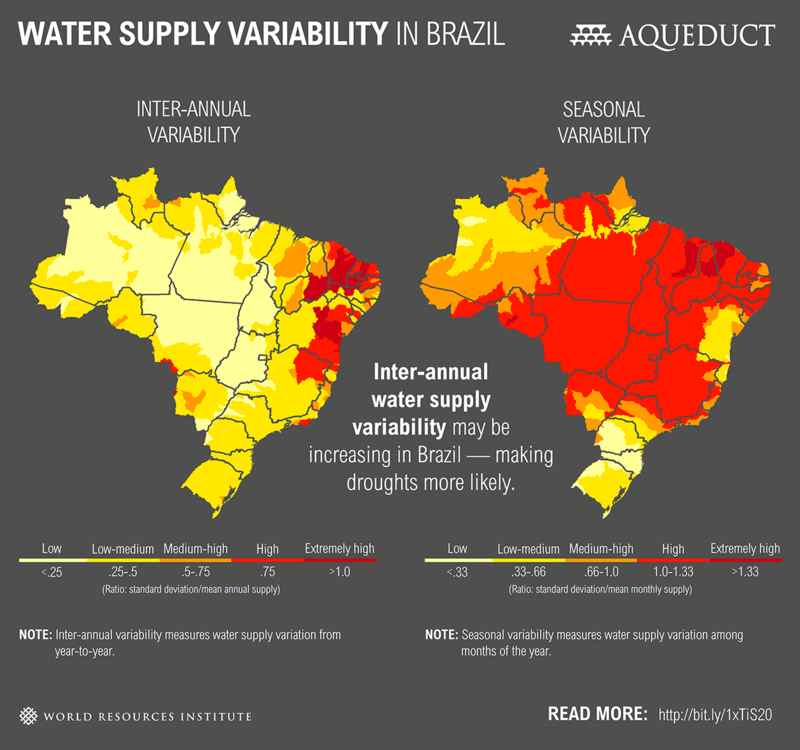 Northeastern Brazil has also experienced considerable fluctuations in total average water supply from year to year — called high inter-annual variability. The ongoing drought in Southeastern Brazil offers a prime example of how damaging a major supply drop can be over the course of a year. It began last summer, between December 2013 and February 2014, historically the wettest time of year. The region received only half its usual amount of rain, according to NASA’s Earth Observatory. In the eight months since, rainfall has hovered at 60 percent below normal levels. There is concern among Brazilian experts that inter-annual variability may be increasing in southern and southeastern Brazil due to heavy deforestation of the Amazon (see section below). Where variability is high, it’s important to store freshwater underground and in reservoirs during wet periods to sustain companies, farms, and people through dry periods. The city of São Paulo depends, among other reservoirs, on the Cantareira System. Its six reservoirs, linked by 48 km of tunnels and canals, provide water to half the people in its metropolitan area. Sabesp, São Paulo’s water utility, reported on Oct. 23 that Cantareira system was reduced to 3 to 5 percent of its maximum capacity. The utility is currently pumping water from the reserves below the intake pipes of the reservoirs. 3) It’s a Deforestation Problem. Expert consensus is building around deforestation as a major driver of this year’s drought and other serious dry periods in Brazil. In 2009, Antonio Nobre, a scientist at Brazil’s Center for Earth Systems Science – CCST/INPE, warned that Amazonian deforestation could interfere with the forest’s function as a giant water pump; it lifts vast amounts of moisture up into the air, which then circulate west and south, falling as rain to irrigate Brazil’s central and southern regions. Without these “flying rivers,” Nobre said, the area accounting for 70 percent of South America’s GNP could effectively become desert. In recent years, Brazil has been hailed for its efforts to reduce deforestation—the average rate of clearance decreased 70 percent between 2005 and 2014. However, deforestation in Brazil jumped during the last officially recorded period, between August 2012 and July 2013, marking the first increase since 2008. Satellite analysis from Imazon, a Brazilian NGO, also indicates a 190 percent surge in forest clearing this August and September when compared with last year. See the animation above, showing tree-cover loss equivalent to an area almost five times the size of New York City. In January and February of this year, when rain is usually abundant in central and southern Brazil, the flying rivers failed to flow south, according to data from Brazil’s National Institute for Space Research (INPE). The animation of tree cover loss alerts from Global Forest Watch is meant to be illustrative only. The exact science of how forest clearing affects the performance of the Amazon’s “hydrological pump” is still emerging, and further analysis is needed to determine how the timing and location of forest loss affects precipitation elsewhere. The “Flying Rivers Project,” an effort by Dr. Nobre and other Brazilian scientists to quantify the dynamics of atmospheric water vapor and forests in Brazil, provides some of the most robust data on the subject, including real-time and historic maps of air flows and water vapor in the region. LEARN MORE: Check out WRI’s Aqueduct and Global Forest Watch platforms, which can help decision-makers improve Brazil’s water and forest resources management. Rachel Biderman, director of WRI Brasil, also contributed to this blog post.